edo simplifies the operation of your multifunctional devices throughout the entire company and facilitates daily workflows with a variety of convenient tools. Make edo your own individual MPS solution! edo simplifies your document workflow, creates cost transparency and allows cost allocation according to the causative principle. Procurement processes for consumables are automated and the administration is reduced to a minimum. 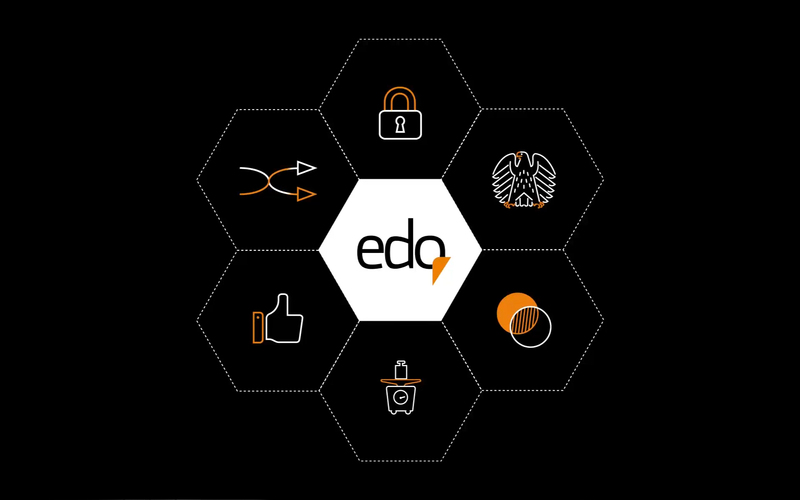 With edo, data protection concerns are a thing of the past. Confidential printouts are not generated until the user authenticates to the MFP. Until then, all data on the edo server is encrypted. With edo, you can consolidate your device fleet, save energy and reduce emissions and noise. edo ensures the constant availability of your device fleet’s consumables without you having to worry about it. edo is a modular software solution that provides flexible applications, processes and services for the usage, control and administration of printers and MFPs. Make edo your own individual MPS solution! edo helps you make your print management more sustainable and easier. Time-consuming isolated solutions are a thing of the past. 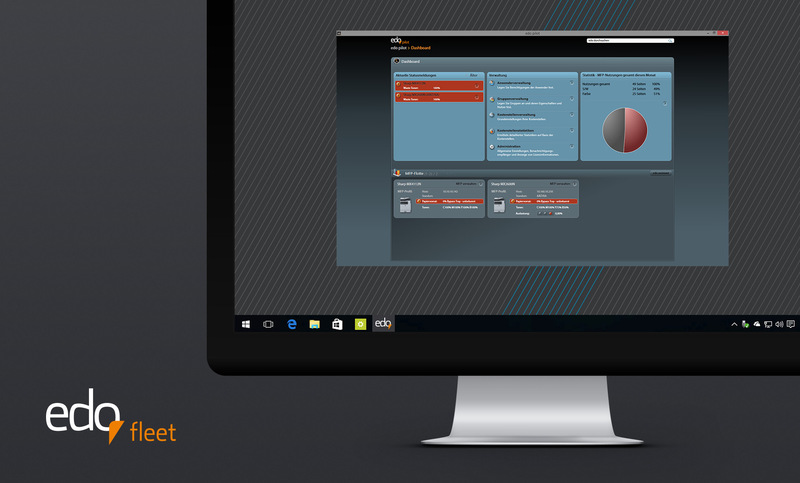 You manage all of your MFP processes with a uniform user interface. Thus, the costly purchase of consumables is being omitted. How much effort is required to manage your existing device landscape? How many printer drivers do you currently have to have available and administrate? How many different copiers, scanners, printers and MFPs are maintained? Who helps your users first when a problem occurs? Each device has a different display, different paper cassettes, paper feeds, error codes and indications as well as various toner cartridges and drivers, settings and much more. In the end, your users just want to print, copy, scan or fax. edo helps you to reduce the variety of your equipment to an optimum. Customized end-to-end devices provide driver equalization. In addition, edo provides user comfort that is without equal. 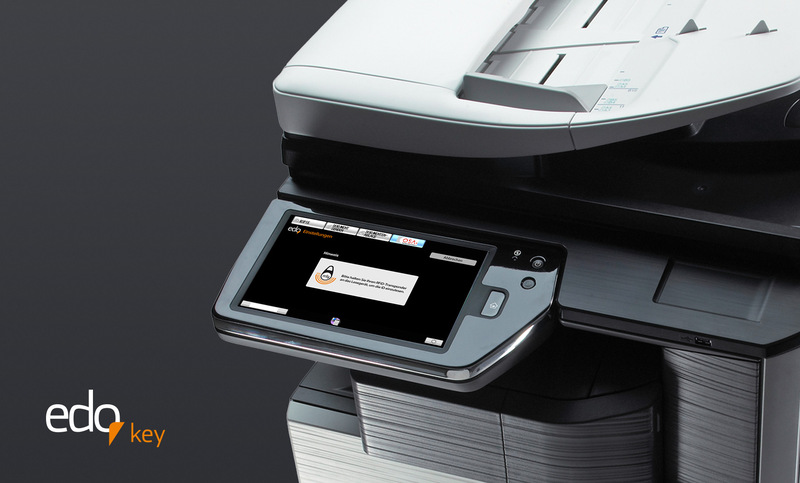 Your IT staff will be informed timely and automatically about the device status of your printer fleet – if desired, even mobile. It is also possible to involve your service partner in the status report and be on-site even before problems occur. edo is a simple and clever tool that enables smooth and fast workflows. Can you pinpoint the expenses emerged in the field of paper output systems at the touch of a button and assign them to the cause of costs? Do you know which costs incur when purchasing consumables or what their stockage utilizes? How many cartridges do you store for devices that are no longer in use? How many devices of different manufacturers and types are currently in use? What different consumables do you need? What processes and how many employees are required to manage this device diversity? 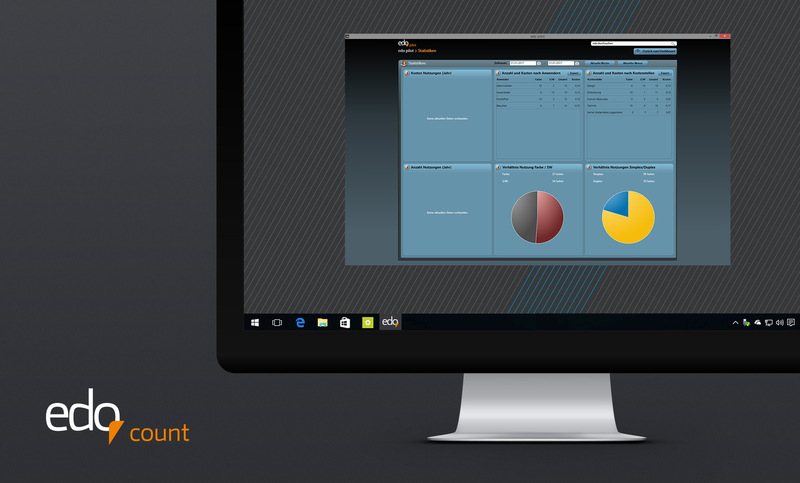 With edo, you adjust your device landscape individually to suit your company’s size and processes. Print jobs can be generated independent of time and equipment. Edo displays costs incurred exactly at any time and enables you to allocate them according to the cost-by-cause principle. You will be informed automatically in case of consumables running low. The effort for procurement processes for consumables as well as material costs are thus reduced to a minimum. 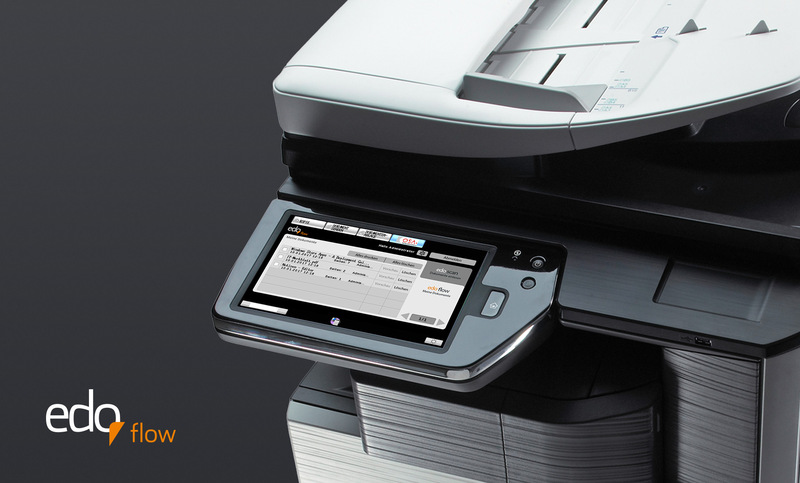 What happens to your printouts generated on centrally installed MFPs? How do you ensure privacy-related documents do not get into wrong hands? How is personalized data protected against unauthorized access by third parties? A print is triggered and sent to a central MFP. Even before the user reaches the MFP, a third party views the documents – consciously or unconsciously. It gets even more annoying when another user accidentally takes "your" print. 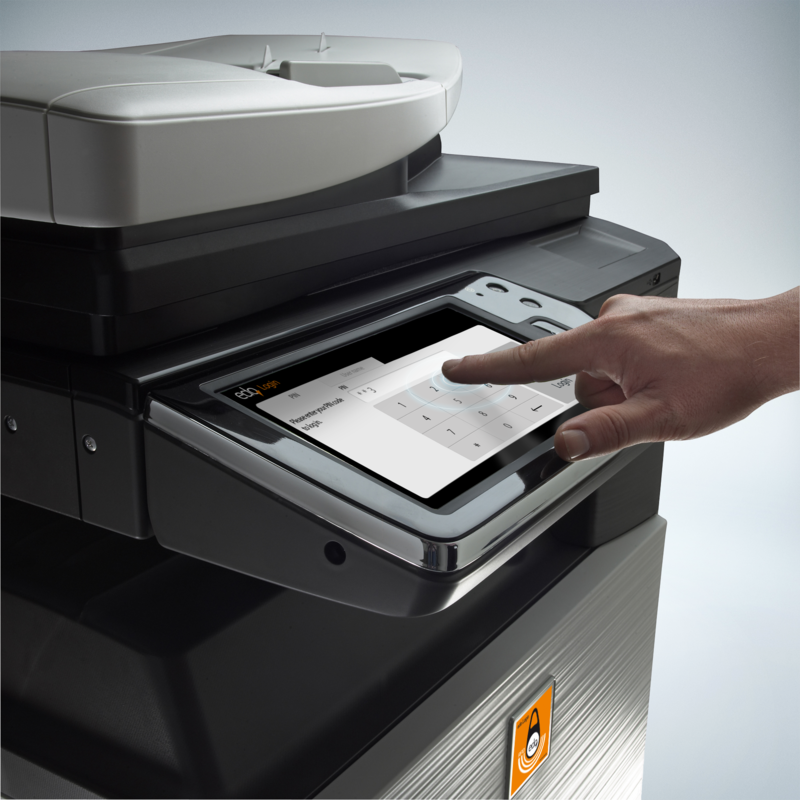 With edo, you decide which document to send as confidential printing to the MFP. edo flow keeps your documents encrypted until you authenticate to the MFP and print them out. After printing, the documents in your print orders are automatically deleted. Thus, unwanted piles of paper and data protection problems belong to the past. How much is the energy demand and toner consumption in your device landscape? How polluted is the work environment with fine dust, ozone, heat and noise? Can you scan documents companywide in a single process? Do you still work with various clipboards or scattered network folders? The creation of a healthy and motivating work environment contributes significantly to the economic success of your company. By optimizing processes, e.g. scanning documents or eliminating the time-consuming procurement of consumables, you gain valuable space for the essentials – your core business. edo helps you to operate a sustainable print management by, among other things, saving electricity through an optimal consolidation of your equipment and reducing the burden on the work environment by pollutant and noise. 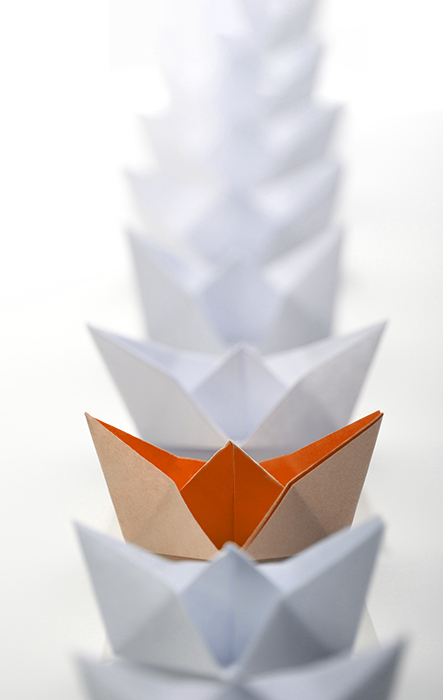 With the various edo modules, you process your documents in a uniform workflow process. edo ensures the constant availability of your paper dispensing systems and associated consumables without you having to worry about them. Thanks to the modular design, edo perfectly adapts to your requirements at any time and can be integrated into existing IT infrastructures quickly and easily. Whether a single MFP or a whole fleet of devices – edo provides the perfect solution for environments of any size. Keep everything in view. In the centerpiece and central cockpit, edo pilot, you overlook your entire device landscape at a glance and manage all the integrated edo modules easily. All the information is available at any time. Thanks to automatic status messages, you are always informed about changes and able to react immediately. In just a few steps, you can integrate a new device. Active Directory synchronization allows you to manage the eligibility of all users and groups throughout your company. Lucid and detailed display of statistics, warnings, cost locations, users, online/offline status, etc. Whether toner or paper are running out, edo fleet informs you at any time and in a current matter by status message when consumables are dwindling. This prevents an unnecessary stagnation of your printing operation. 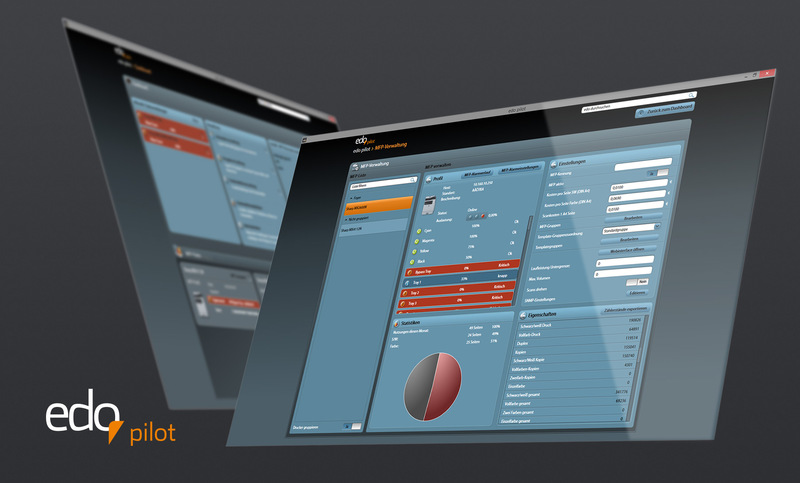 Take advantage of the possibility to send individually configurable status reports by e-mail and inform your service provider in detail about the condition of your equipment fleet – who can now react without you having to do anything to make it work. edo count creates cost transparency and allows allocation according to the polluter pay principle. Therefore, you easily create cost centers and define projects. Statistical evaluation gives you an accurate overview of the costs incurred per period. When it comes to data security, edo flow even meets the highest of all requirements. Only after the user has authenticated to the MFP, the printout follows. Your employees decide when and where to pick up their documents. By then, the data on the edo print server stays encrypted. As highly sensitive documents are no longer left unattended in the terminal's output tray, your company's valuable information is always perfectly protected. edo scan simplifies your document workflow and central administration. Immediately, every user receives his personal scan destinations to choose from. 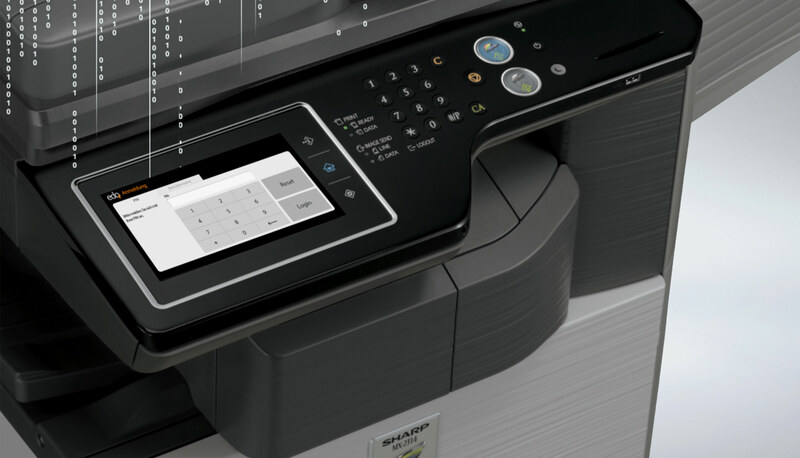 Depending on the connected MFP, edo scan allows you to create different file formats (TIFF, PDF/A, DOCX, XLSX, PPTX, etc.) as well as the removal of blank pages. Thanks to edo key, you authenticate with a transponder on the MFP and immediately access the functions of the terminal. In doing so, edo supports a variety of reading devices with different technologies. 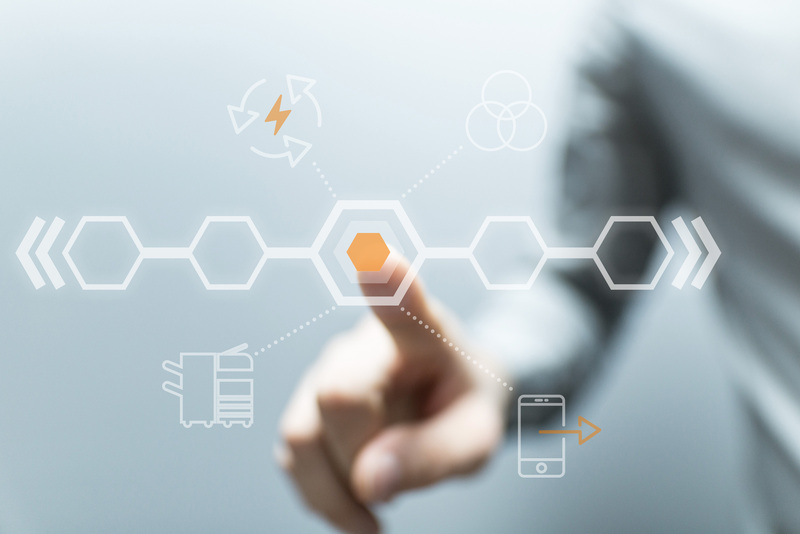 edo connect extends the functions of edo scan and is perfect for users who want to start a document workflow directly via MFP or also to trigger an existing DMS system without any detours. Individually buildable scan profiles can be configured by users with edo pilot in whatever way required, e.g. incoming invoices, delivery notes etc. Thus, every DMS system, up to SAP, can be integrated. edo web provides browser-based access to your edo landscape. 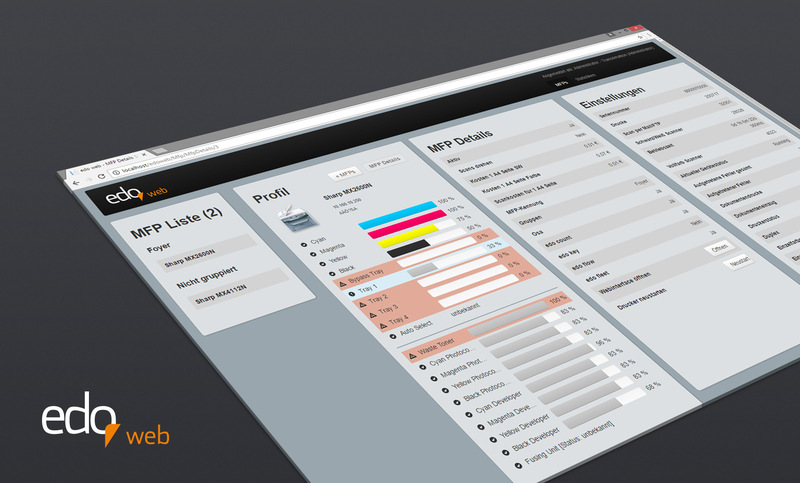 This allows you to obtain detailed status indications of every web-enabled terminal regarding connected devices and their respective configurations as well as statistics on all relevant key figures of your printer fleet, such as usage, cost centers, users, groups and user-related costs. With edo web, you get access to information that would otherwise only be available to your administrator – around the clock and from anywhere in the world. With our news you always stay up-to-date. Here you will find all news and future activities regarding edo. We are experienced software developers and designers, usability specialists, system integrators and experts with many years of experience for MFP & Printing System Solutions. We provide a simple, intuitive software solution that meets all your requirements and provides a sustainable management of valuable resources. We develop new and innovative solutions to optimize processes and to improve work in offices permanently. edo is exclusively marketed by certified edo partners. We maintain partnerships with leading manufacturers of multifunctional devices as well as with universities and higher education institutions. 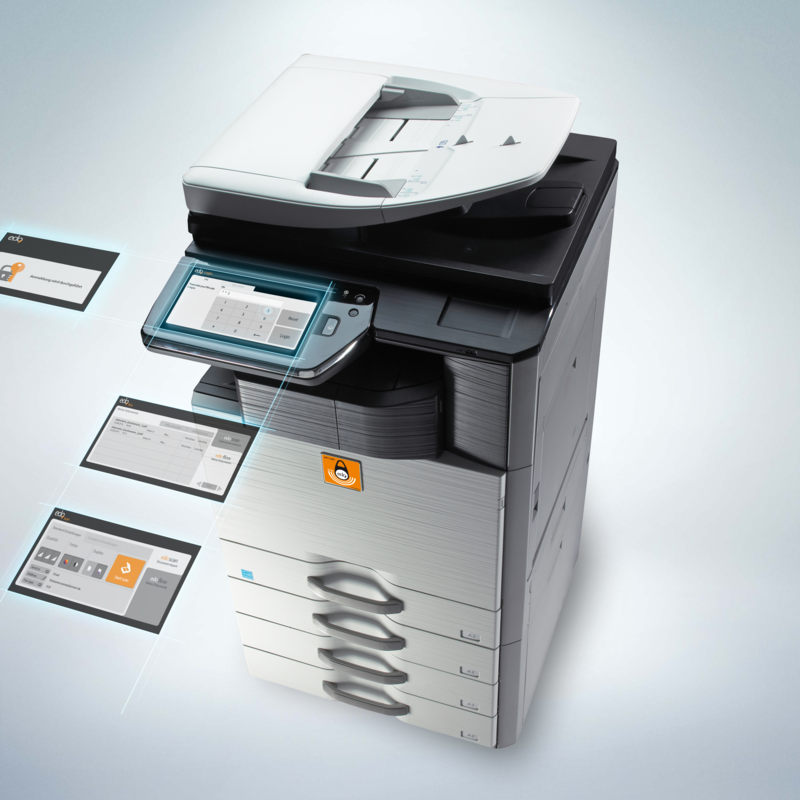 The introduction of the managed print concept, which includes hardware and software, is a great success for the city administration of Uebigau-Wahrenbrück. Furthermore, the new concept relieved the administrative staff and the IT department. Thanks to the uniform user interface, even older administrative staff can cope with all new devices in the best possible way. Thus, the acceptance among colleagues was very high right from the start. Even allergy symptoms of our employee in the mayor's office have been significantly reduced. I immediately liked the intuitive user interface and the well thought-out modular structure of edo. When I was asked whether I would accompany edo through my chair, I was immediately enthusiastic and said' yes'. We were able to incorporate our know-how for mobile applications and research of new technologies for sustainable use of resources into the edo project. Are you an experienced, solution-oriented company active in the field of paper output systems? Do you want to offer your customers added value? We appreciate your interest and we are looking forward to getting to know you more closely. We are looking forward to hearing from you. Just send us a message and we will get back to you as soon as possible.